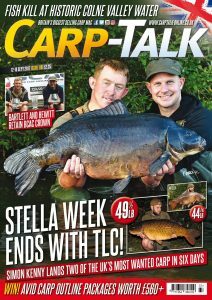 Carp-Talk 1191 is available to download now from pocketmags.com/carp-talk-magazine#57595d02e03f4. 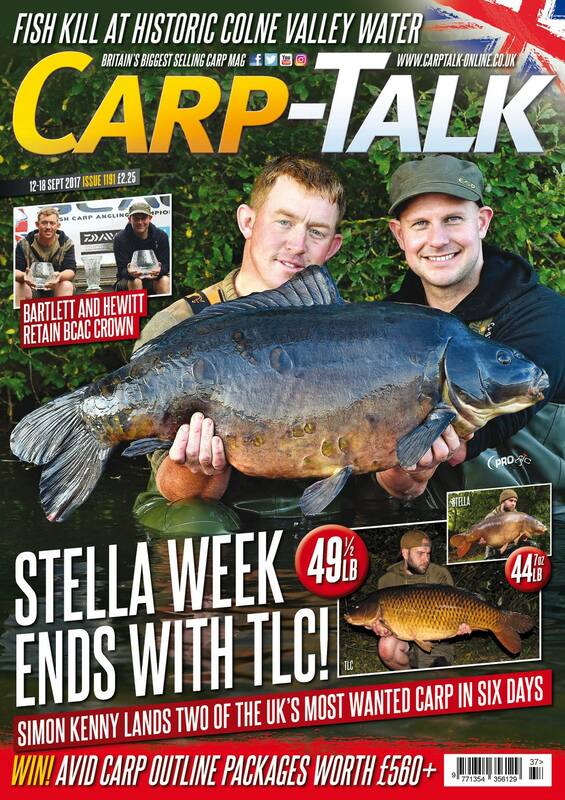 In the week that Mark Bartlett and Kev Hewitt became only the second pair to retain the British Carp Angling Championships title, we tell the remarkable tale of Simon Kenny’s captures of Stella from the Essex Manor and TLC from Nunnery A Lake in the space of six days. We’ve also got a new UK fifty for James Salmons, Dave from Bluebell and Three Scale from Erics Willows amongst a host of big fish. Harry Pratt of Fox International explains why the right choice of kit and tactics can help outwit wary, line-shy carp. Jamie Peacock of The official Nash Tackle page reveals why confidence plays a huge part in his angling, and Mark Wozencroft of Wychwood Carp returns to Farriers and gets back amongst the whackers. Tim Childs of RidgeMonkey talks tiger nuts, Simon Bates of Shimano-Tribal extols the virtues of surface fishing, and Ben Soane of Bait-Tech Carp Scene recalls his many ups and downs on the Grand Union Canal. We’ve got a load of Avid Carp Outline products to give away, and the CC Moore & Co Ltd monthly winners are announced.